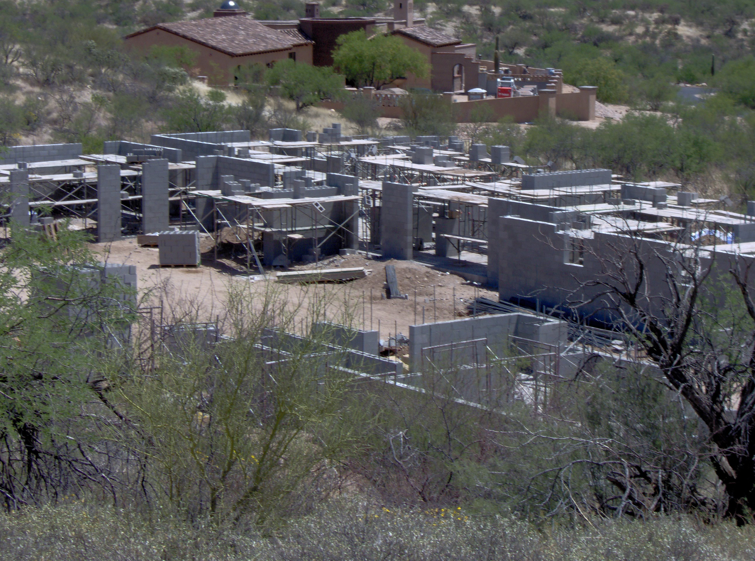 There are approximately 18 different Insulated Concrete Forms (ICF) on the market as of January 2019. 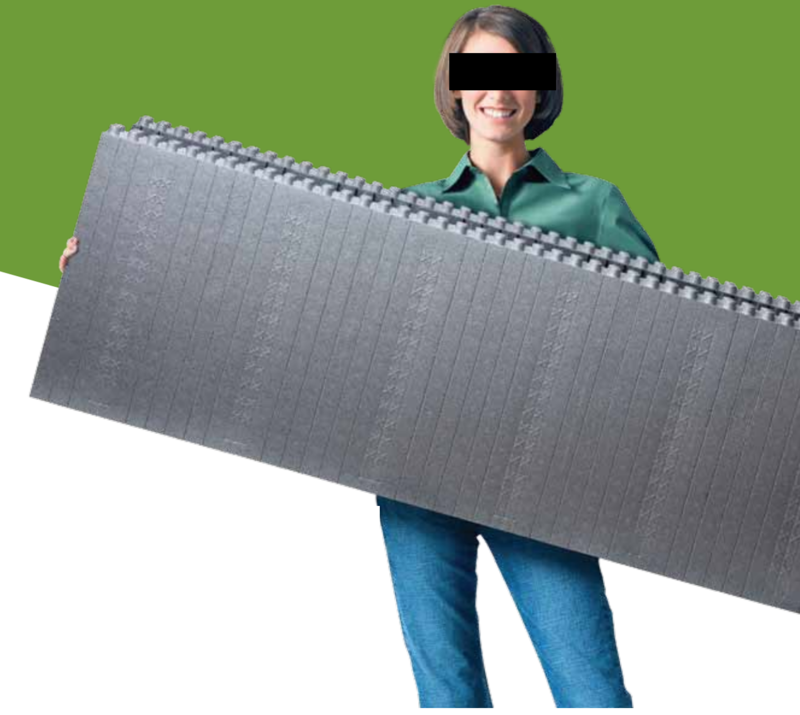 All are lightweight (2.5 lbs) and are easily handled and stacked on a construction site, which is an advantage. Clearly, anytime you can make the installation process easier and quicker, it is desirable. 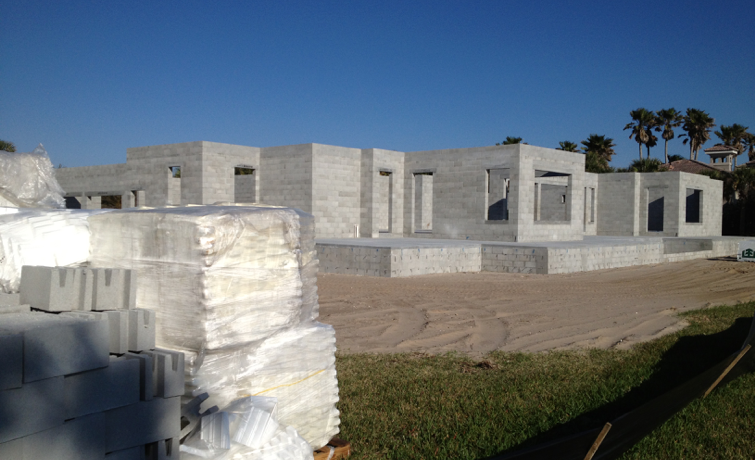 ICF units all have Expanded Polystyrene (EPS or an EPS/cement mixture) on the interior and exterior sides of the block. 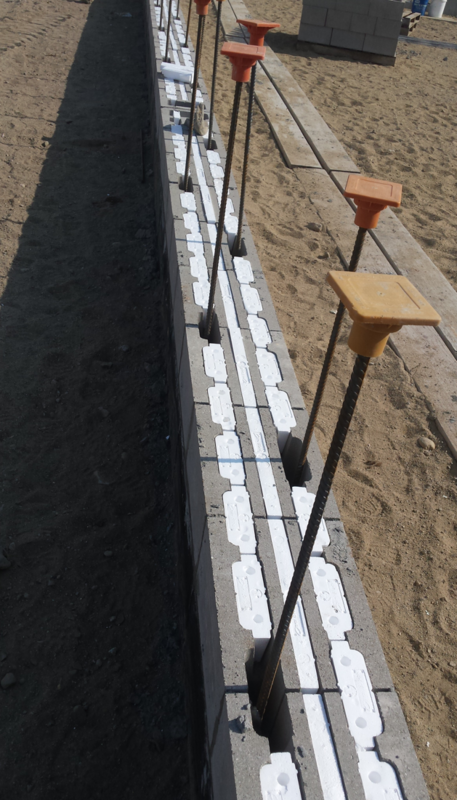 Rebar and grout (per engineering) are filled within the block once it is installed in the building. Albeit a very reasonable question, the simple answer is that the only real similarity is that neither products are wood. 2) Omni Block executives focus on the “what and how” Omni Block performs and is constructed. 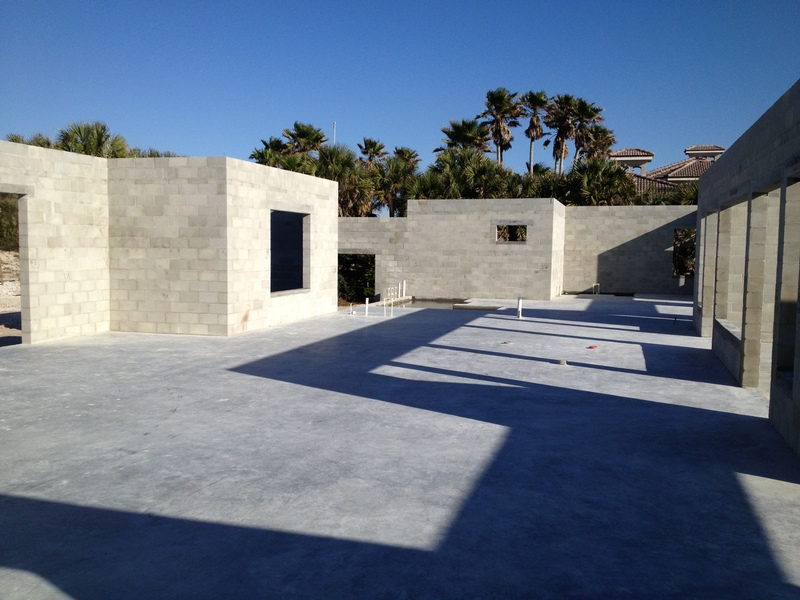 The photos or links below are examples of Omni Block and ICF construction. Judge for yourself which product looks to be more labor-friendly and which product would you rather have on your personal job site. All information is accurately presented to the best of our knowledge. The big question, which one performs better thermally? Which one will lower your utility bills and provide lasting comfort? Click here. 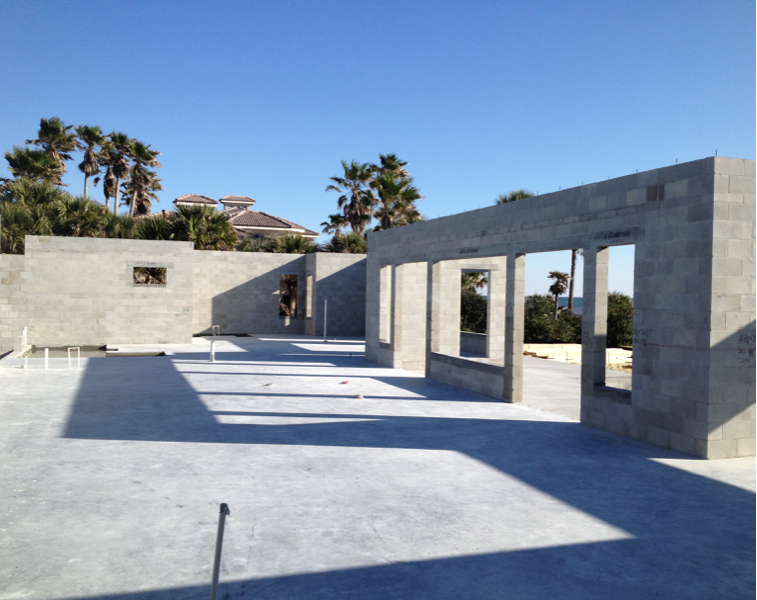 Omni Block and ICF’s both utilize concrete and EPS insulation, however the location of each is much different. 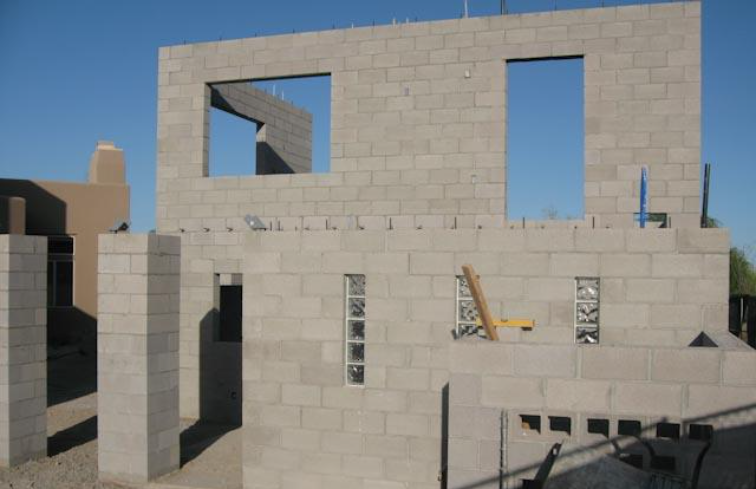 ICF blocks have the EPS on the interior and exterior sides of the wall with concrete in the middle, whereas Omni Block has the concrete on the interior and exterior sides of the wall with the insulation located in the middle. This may not seem like much, but the location of the concrete and insulation is a major difference between the two systems. The net effect is that one system utilizes exposed thermal mass and the other does not. Omni Block is heavyweight construction. Individual System 8 units usually weigh around 38 pounds, which is about 2 pounds more than a standard concrete block of the same dimensions. It is not easily handled or stacked and is normally moved with forklifts until it is manually stocked on a job site. 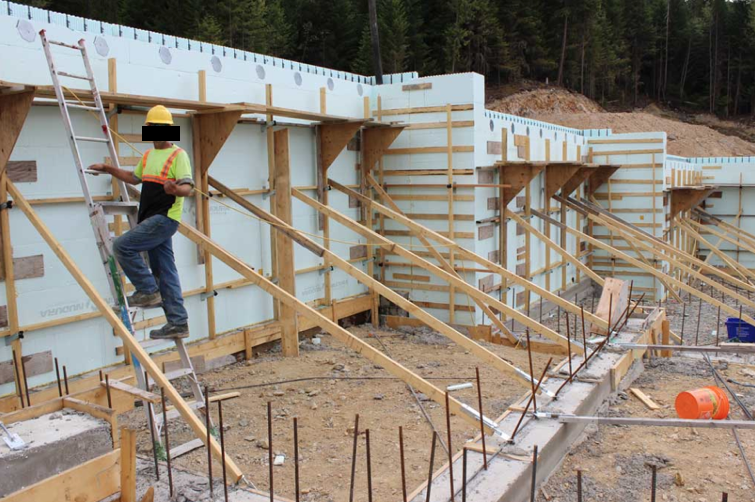 The photo on left shows an ICF wall erected with rebar installed (many systems have easy methods of placing the rebar) and is ready for grout to be poured into the wall assembly. Notice the specialized scaffolding that is being used on this very clean and organized job site. The photos below show some of the methods of wall support bracing. Wall support bracing is mandatory because the EPS foam blocks are so much lighter than the heavyweight grout that will be mechanically pumped into the wall. 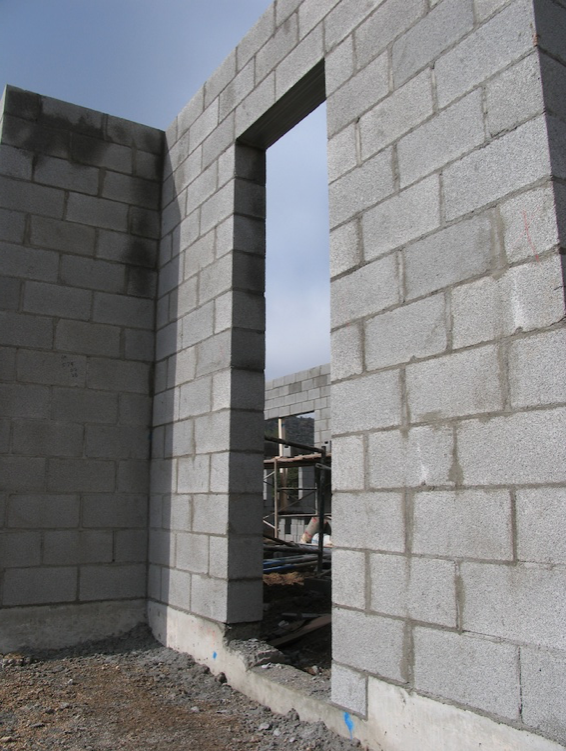 Omni Block is erected the same as standard concrete block. The same tools, scaffolding, mixers, mortar, and when it is up, it has the exact same appearance as standard concrete block. 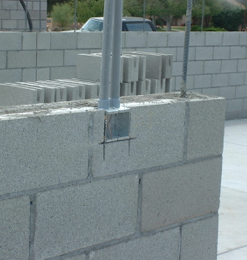 Once the block is set in mortar, no bracing of any kind is used. 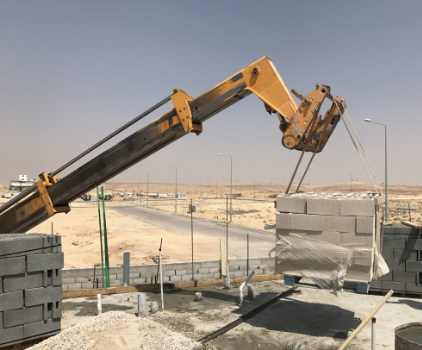 This is because the block is heavyweight material and when grout is poured into the block it is plenty strong enough to handle all of the pressure of the grout. 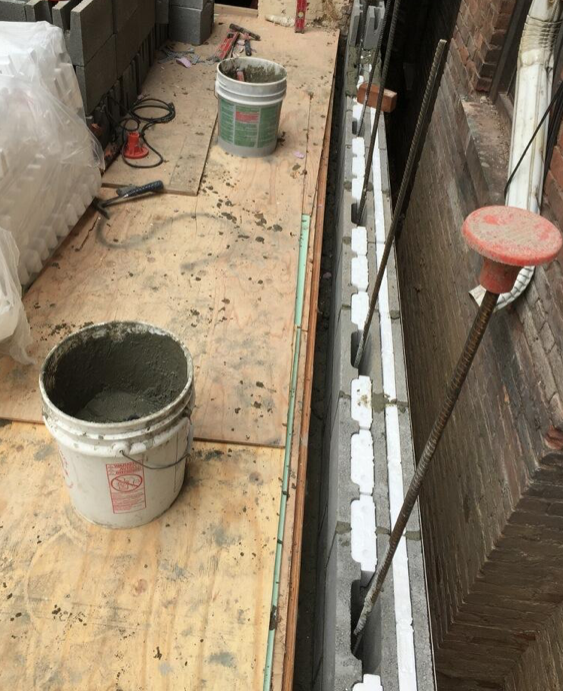 The photo to the left shows an Omni Block wall “topped-out) so there is horizontal rebar (bond beam) and vertical steel that is not seen but is located within the wall, but held down a couple of inches below the actual top-of-block. 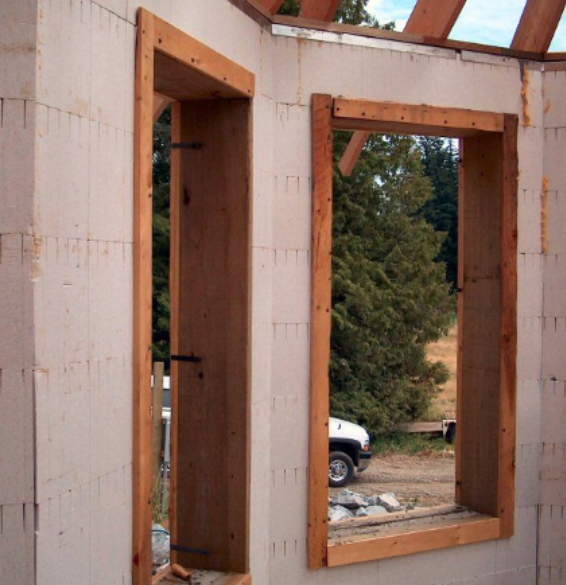 In many cases, the bond beam course is insulated with one layer of insulation. The interior cell inserts are not installed to accommodate the horizontal rebar. The photo above is a large Omni Block job site (50% completed) that from afar looks just like a standard concrete block job site. At Comparison 1 the walls are erected, but remain ungrouted, the main difference between Omni Block and an ICF is that Omni Block does not require any bracing and ICF construction always requires it. Grout day is when it gets very interesting for the ICF contractor. As previously noted, the foam blocks are lightweight and handled easily, so easily that the foam blocks can crack ever so slightly. They can crack as they are being installed or after, should someone inadvertently bump into a block or a scaffolding rack gets nudged into it. After all, it is a construction site, many things can happen to the ungrouted foam block. The photo to the left shows the infamous “blow-out” that can occur without warning. There is about a yard of grout running out of the wall, costing $100 in the least expensive markets. It is not the cost of the grout that is worrisome, it is the cost of the clean-up, the repair and the rescheduling of another grout truck that can add $100’s more. Blow-outs always tend to occur at the bottom of the grout pour where the pressure is the most extreme. The ICF contractor above noticed a problem and looks to have caught the issue before it really blew out. The photo does not show how much grout was lost. 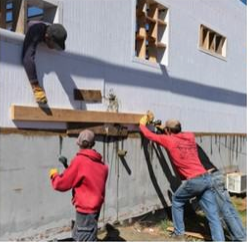 It takes several people to push the wall back into place and requires long horizontal braces on both sides of the wall to shore it up. The grout pressure is enormous and very heavy. Moving a wall back to plumb that is filled with grout is difficult, if not impossible. The resulting repair, showing the extra bracing materials, is shown in this photo. Even what appears to be 2×8 material is no match for the grout pressure, so there is surely a bow in this wall. ICF contractors remedy this type of bow by shaving off some of the foam. Grout day on an Omni Block job is uneventful. As with other standard concrete block, Omni Block projects are grouted usually every 4′ in height (or every 6th course of block). 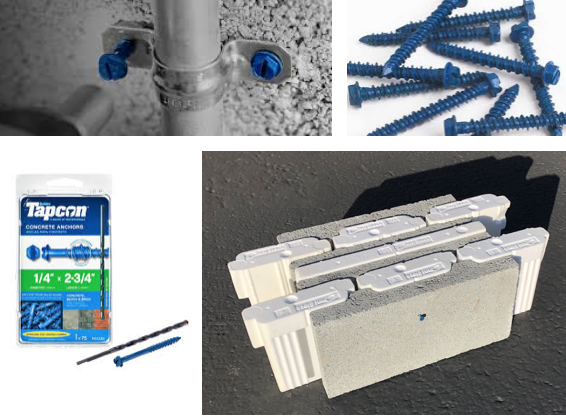 The pressure from the grout would the same on a per foot basis, but consider that Omni Block grout cells are isolated and defined by the EPS inserts installed in all non-grout cells. 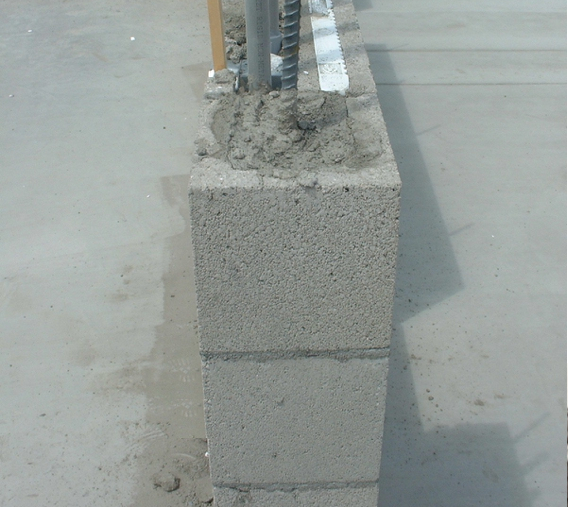 The individual block is manufactured with a minimum 2000 psi concrete mixture (see Testing) and is strong enough to easily handle the weight and pressure of grout. In a perfect world, insulation (heat resistance) would be on the outside of the wall. 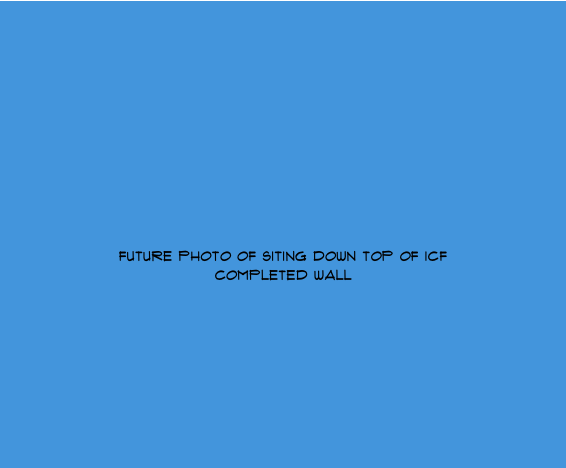 ICF’s have this part totally correct. The second part of the perfect world however, is that thermal mass would be in the inside of the wall and exposed to the living/work environment. Omni Block has the second part totally correct. To add to this, Omni Block grout cells are typically on the interior inside of the wall, thus while giving up some insulation where the grout cells do occur, thermal mass is added. If you analyze the individual System 8 Omni Block unit, there is an interior face that is masonry (thermal mass) then a layer of insulation with minimal cross-webbing, then a layer of masonry (not thermal mass since it is not exposed to the living/working environment), then another layer of insulation with minimal cross-webbing… stop there! Insulation is on the outside of the wall, the additional layer of masonry is only there for structural reasons and results in a durable wall that can be finished in a wide variety of ways and colors. The System 12 pictured above adds a third layer of insulation followed by a fourth layer of masonry, all with minimal cross-webbing. ICF constructed buildings have no effective thermal mass because the insulation on the interior side of the wall that is exposed to the living/working area resists heat from reaching the mass within the wall. The photo on the right shows a door jamb grout cell at the 4′ lift. Technically, the grout should have been held an inch or two below the top of the block. 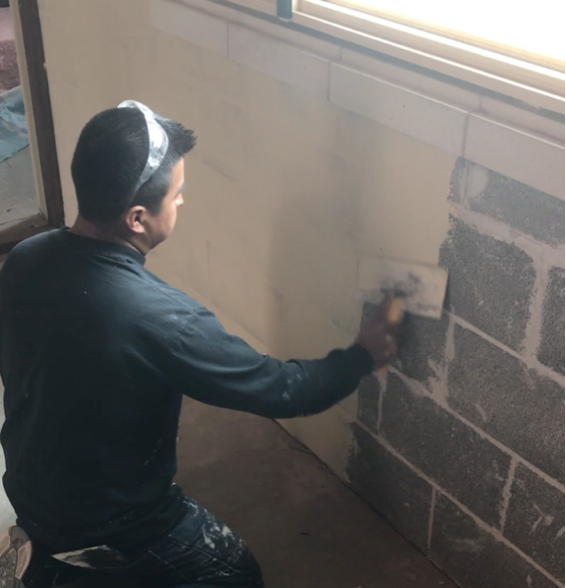 In the industry this is called “keying” the cell so that the joint where the grout from the next lift meets the lower grout level occurs within the block not at the mortar joint. Keying makes for a slightly stronger wall. The Omni Block wall below was just grouted at the 8′ lift and now the mason can begin laying block immediately. The photos above and to the right show a completed Omni Block project with 12′ tall walls, which required 3 grout lifts. Comparison 2 is the grouting process. 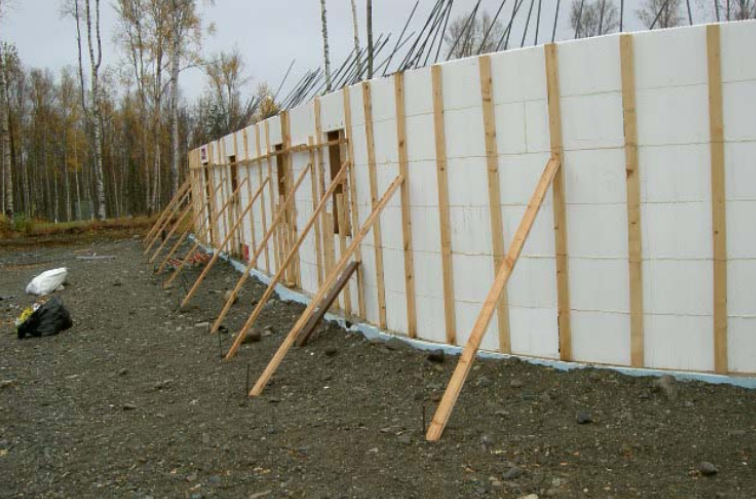 An ICF wall can present major challenges due to how lightweight the foam blocks are. Omni Block has never had a “blow-out” (at least that we are are aware of). 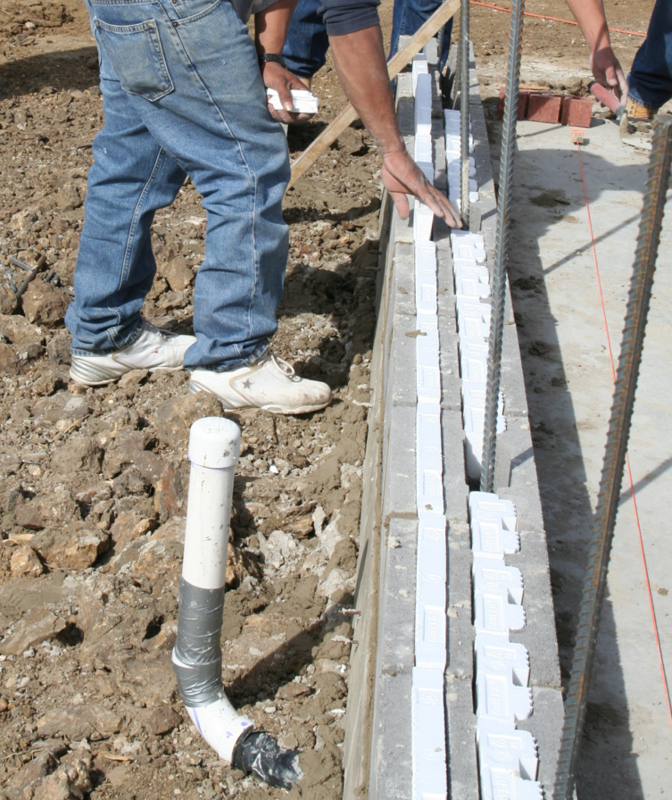 ICF walls are rarely straight and plumb after grouting as shown in the photo to the left. This wall is not out-of-plumb fractions of an inch, but rather, several inches. 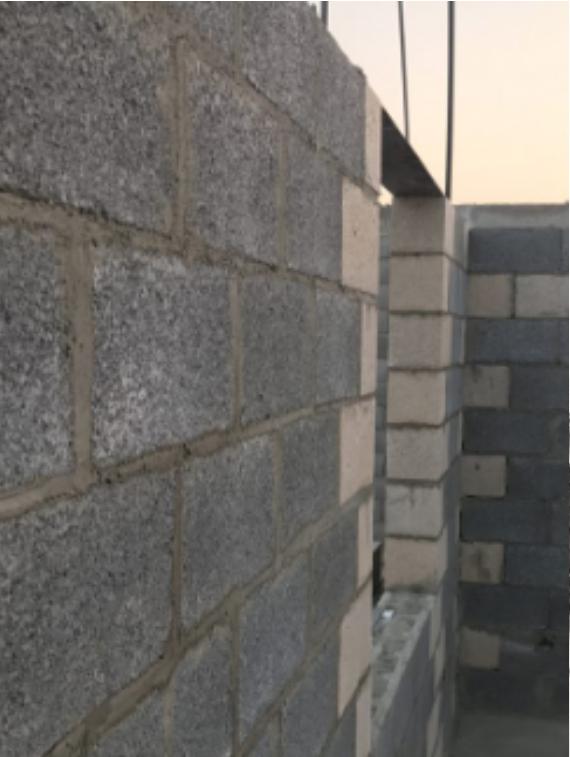 Since all ICF systems consist of lightweight block and use heavyweight grout within them, it doesn’t matter which system you choose, they are all prone to walls that are not straight and are out of plumb. One telling way to determine whether or not walls are plumb is “sight” each vertical block edge and compare it to a vertical edge next to it. Notice all vertical edges are parallel to one another, which means all of them are plumb (even in Saudi Arabia below). 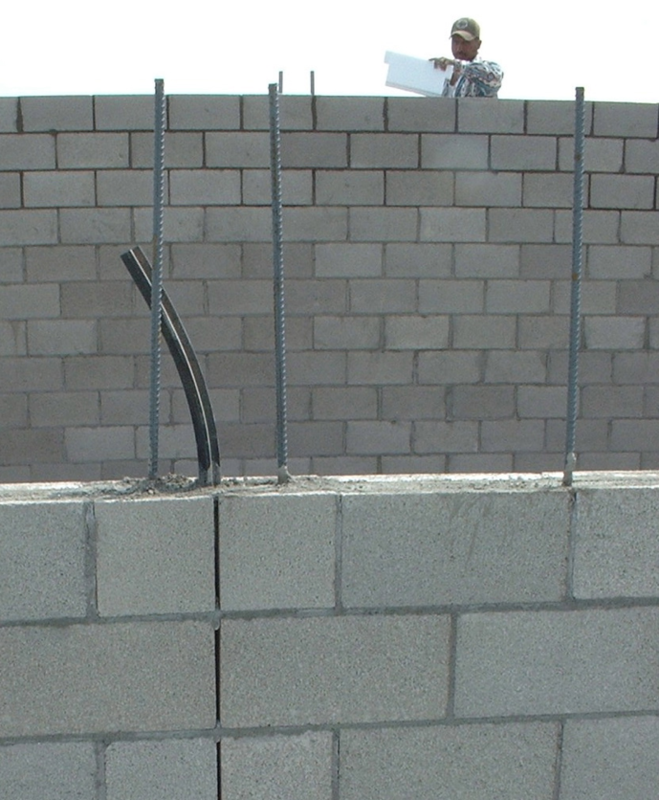 Comparison 3: Omni Block walls are always straight, plumb and true. ICF walls always struggle to be to be straight and plumb, even to the naked eye. The electrical in ICF construction is easily installed by hot-knifing a grove in the face of the foam block where electrical is called for. PVC-jacketed electrical wiring (Romex illustrated in the photos to the left and below) is then placed in the groves. 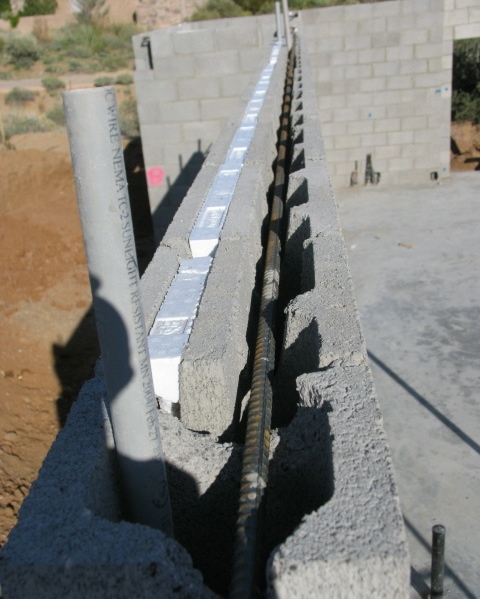 Electrical wiring can run anywhere on the surface of the foam block; advantage ICF construction, or is it? 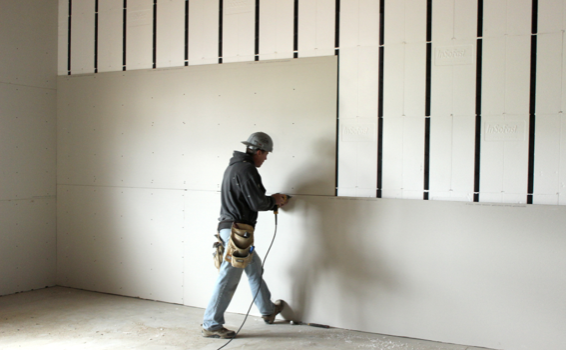 Sheets of drywall are used to cover the foam block wall along with the electrical wiring. The electrical wiring is unprotected other than a thin jacket of PVC and once the drywall covers the electrical wiring no one knows exactly where it is. What happens when a picture, mirror or anything is hung on the wall and a nail or screw hits that unprotected wiring? Why does code allow this installation technique if it is unsafe? What if your wife or one of your kids wants to hang a photo and hits that wiring with a nail or screw? 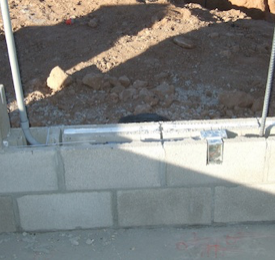 How is an additional electrical box added to an ICF wall? How is a defective wire repaired should one occur in the future? The photo directly above shows numerous electrical boxes that are connected via vertical and horizontal electrical wiring that is completely unprotected. The wiring is slightly inset from the surface of the foam block wall as illustrated by the photo above left. 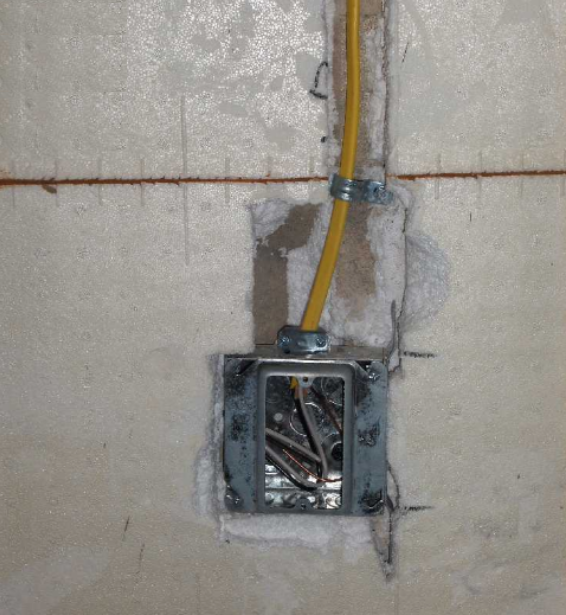 As an example, prevailing construction codes in most States require that electrical wiring that is run within a wood frame wall be protected by metal plates as shown in the photo to the left. 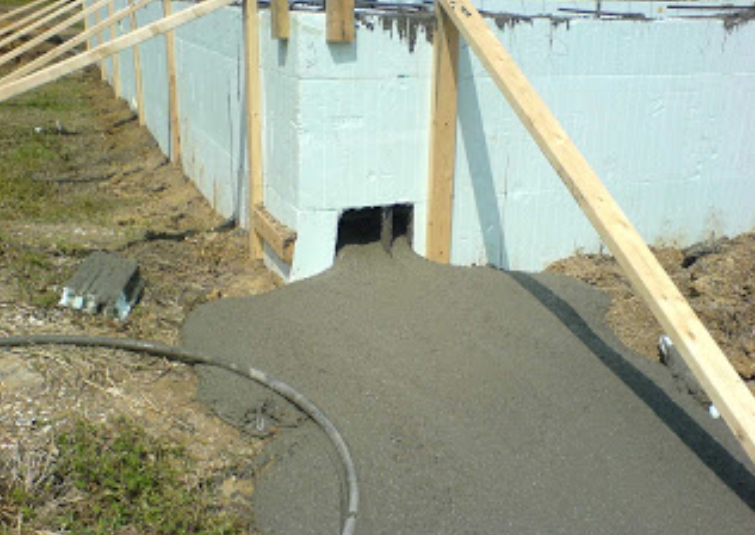 This is suitable protection, but no protection exists for ICF construction. The electrical wiring located within Omni Block is always contained in National Electric Code (NEC) approved Schedule 40 Rigid PVC Non-Metallic Conduit. This conduit is always attached to code approved metal electrical boxes for complete electrical wiring protection. 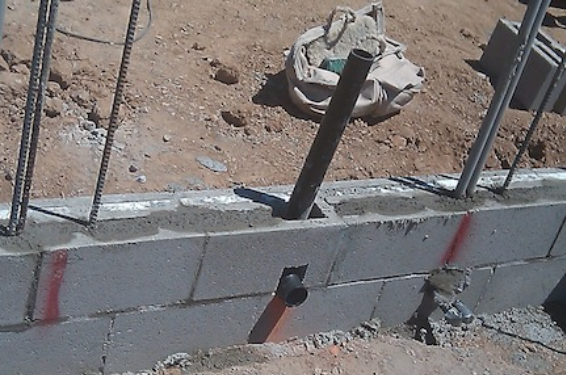 The 3/4″ conduit is normally run vertically and horizontally within the Omni Block wall. The photo at right shows a single gang electrical box with attached conduit that run to other electrical boxes per the building plan. The insulation inserts have yet to be installed. The interior insert is horizontally snapped in half and placed below the conduit. For a step-by-step pictorial of the electrical installation process visit the Electrical Installation pages of this web site. You can also see all the electrical details on Page 11, Page 12 and Page 13 of Omni Block’s Construction Manual. These links provide instructions on how to install everything from the meter main to the low-voltage wiring and interior as well as exterior single, double and triple gang boxes. The photo to the left shows a standard single-gang electrical box with its face flush with the face of the block. Notice that the back of the electrical box abuts the middle block layer eliminating any chance for the box to move. This electrical box has a connector on the top of the box indicating that there will be vertical conduit attached before the next course of block is laid. Insulation is being installed in the above photo as the electrical box and horizontal conduit is put into the wall. Conduit always allows for additional wiring to be added in the future. Photos to the right show a 110v box and a low-voltage box being installed at the standard top-of-box height of 16″. Conduit is stubbed into future framed interior walls making it easier for the mason and the electrician. A double-gang switch box is installed in the photo above at the standard height of 48″ top-of-box. The photo shows how conduit is run when an electrical box is required under a window opening. Comparison 4 addresses the overall electrical installation and end-result. This comparison is somewhat mixed because while ICF construction is more flexible, it is completely unprotected and adding any future electrical needs is a major ordeal (attic access and considerable drywall repair). 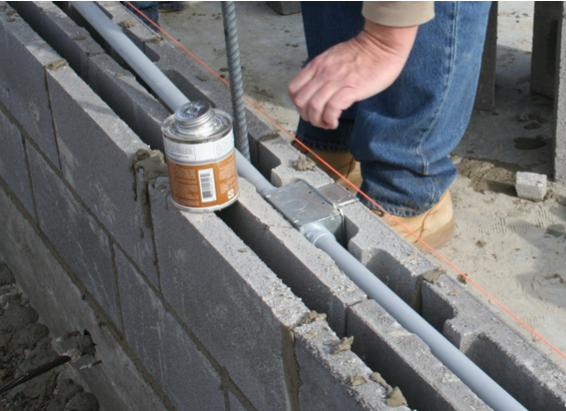 Omni Block’s electrical wiring is always protected in conduit and even behind a masonry layer. Every electrical requirement can be implemented making it flexible as well. Most any future electrical need is significantly easier to add by cutting into the block at the desired electrical box location, then cutting into the conduit that is run within the wall and fishing additional wiring. These photos show how plumbing drains and waste vents are run within the foam block walls. This technique provides maximum ease of installation and flexibility. It also leaves all the PVC pipe, when covered by only drywall (standard practice), with almost zero protection from someone in the future driving a nail or screw into the piping. Plumbing pipe (copper or PVC) that is required in exterior walls can be run within Omni Block. Most of the time, it recommended to design buildings such that the plumbing is contained within interior partition walls to eliminate pipes from freezing, etc., but please see plumbing integration for photos and plumbing design details for instances that require plumbing to be on exterior walls. The photo on the left shows an Omni Block stem wall (before the slab) and a waste vent that is located on an exterior wall. Waste vents and other larger diametered pipe are housed in Omni Block corner cells and are alternated vertically. Comparison 5 focuses on the plumbing phase of construction. 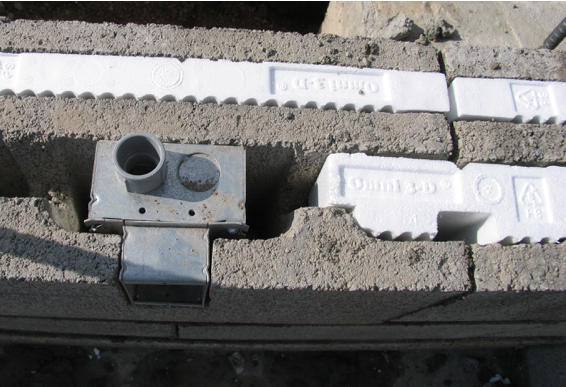 Although both construction types can quite adequately allow for practically any plumbing situation, it is easier to hot-knife the ICF foam block than to run piping within block cavities. 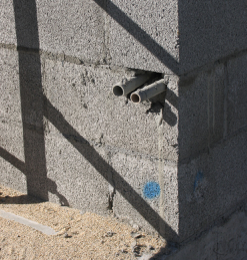 The drawback with the ICF construction plumbing installation technique is that the plumbing pipe is left protected by only a drywall covering. Building codes require metal plates to cover plumbing pipe to increase its protection. 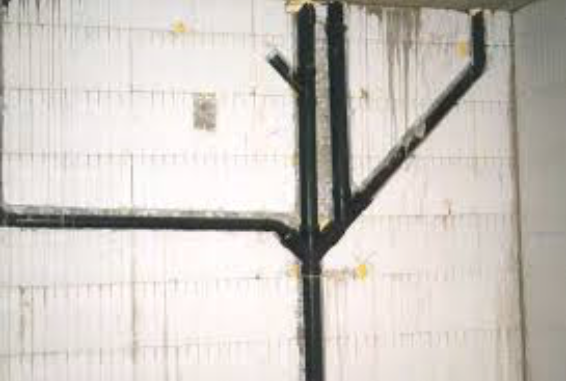 Why ICF construction is not required to protect the piping contained within their wall is a mystery. 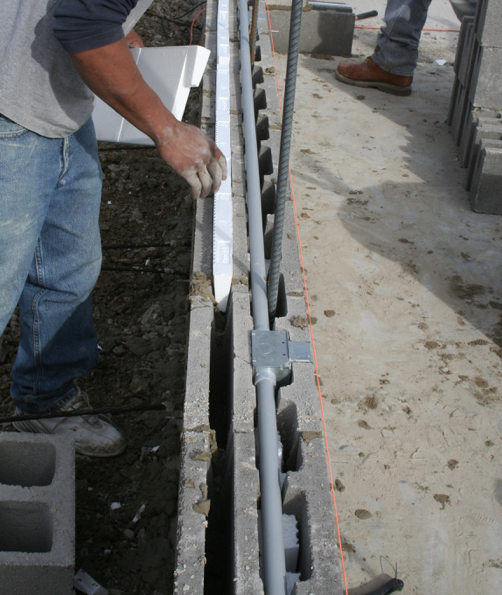 All plumbing that is housed within an Omni Block wall is protected by a layer of concrete. 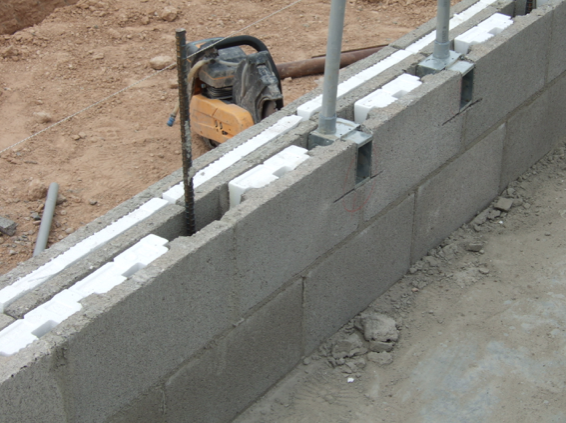 Most ICF systems have plastic connectors between the foam sides of the blocks. These plastic connectors also serve as vertical strips to screw drywall sheets to. ICF walls require wood nailers (bucks) around all openings and where heavy items (cabinets, mirrors, adjoining interior walls) are going to be affixed to the wall. 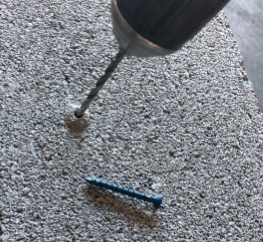 Attempting to affix these type of items without nailers would mean that very long and very thick masonry set bolts are required in order to get through the interior foam face and into the grout behind. The preplanning of where all of the future attached items are to be located is paramount, but certainly doable. The wood nailers are securely attached to the face of the foam blocks and all jambs of window and doors by adding bolts or long screws through the nailer and into the area that will be grouted. The wood nailers are in effect cemented into place, which also means that they cannot be moved. Note that the inorganic ICF system now has organic (wood) integral parts permanently introduced into the building’s exterior walls. Omni Block exterior wall construction does not have nor are wood nailers required (see above several photos with examples of Omni Block window and door openings). 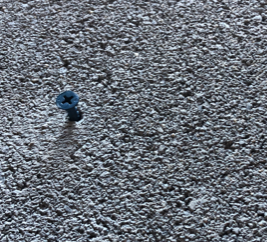 The use of Tapcon fasteners, which come in a wide variety of sizes and shapes and are available at almost any hardware store, can easily affix any heavy item anywhere directly to the concrete block wall. Tapcon screws are packaged in kits that come with the appropriate masonry drill bit. These bits make a very small holes. 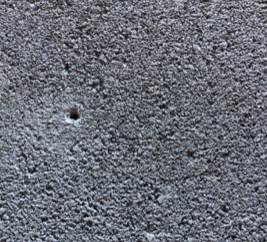 In the event that the hole is no longer needed, it is easily repaired by plugging the hole with a very small amount of drywall compound. So, not only can items be installed anywhere, but they can be easily moved. Although plenty strong, drilling into block with the proper bit is much easier than drilling into concrete. A small hole is all that is needed to hang very heavy items anywhere along the wall. To patch, use a small amount of grey putty. Tapcon screws are easily screwed into the block and are rated at 75 lbs. each screw. Two screws would hold 150 lbs. Comparison 6 deals with the requirement of wood nailers or bucks when constructing with ICF systems. 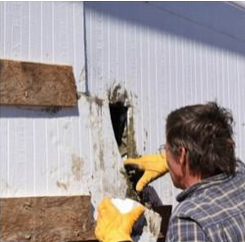 This requirement adds to the construction time and introduces organic materials into the exterior wall of the ICF system, which can lead to mold growth and rot. Omni Block construction does need, nor is wood recommended anywhere, except the top plate above the block for the block-to-truss connection. This is a significant advantage for Omni Block. 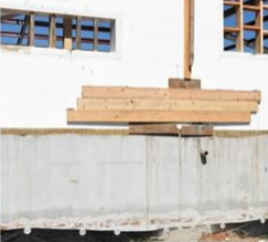 The photo on the left shows how drywall is installed on an ICF constructed wall. 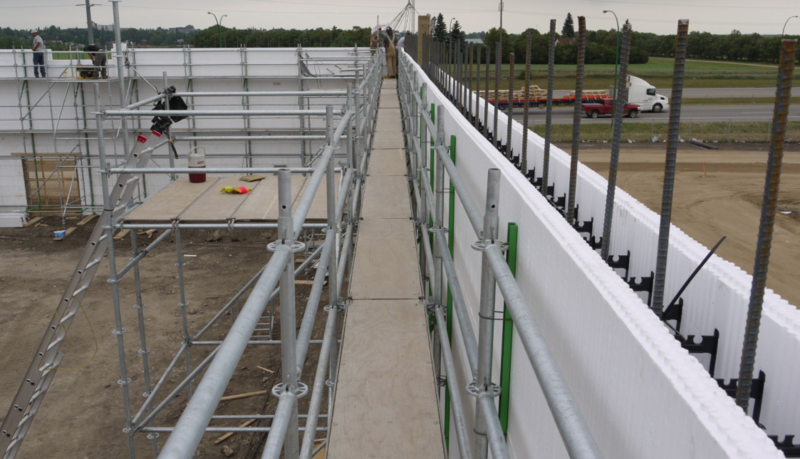 Many ICF’s plastic cross-webbing make up the vertical bracing that allows for screws to be used to hang drywall. It does not appear that this particular wall has any plumbing chases or electrical boxes for the drywall subcontractor to be concerned about. 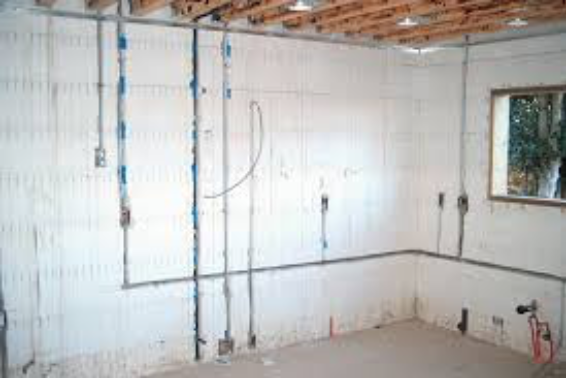 This would be the cleanest of all drywall installations on ICF walls. If there were plumbing pipes and/or electrical wiring in the wall that is covered with drywall, special attention would be required so that drywall screws would not penetrate either of them during drywall installation. 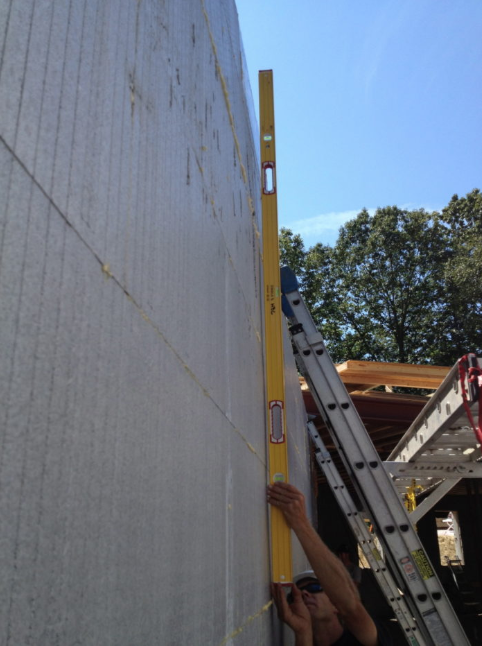 Adding sheets of drywall significantly reduces the thermal efficiencies of an Omni Block wall. It is highly recommended to never drywall over an Omni Block wall. Skim-coating drywall compound onto the block provides the same final appearance as sheets of drywall, but does not affect or reduce the exposed thermal mass properties of the wall. The photo to the right is a typical skim-coat application. For a complete review of the Omni Block drywall process click on this link. Drywall compound bonds extremely well to block surfaces and will not chip of the surface. What causes cracking is movement. 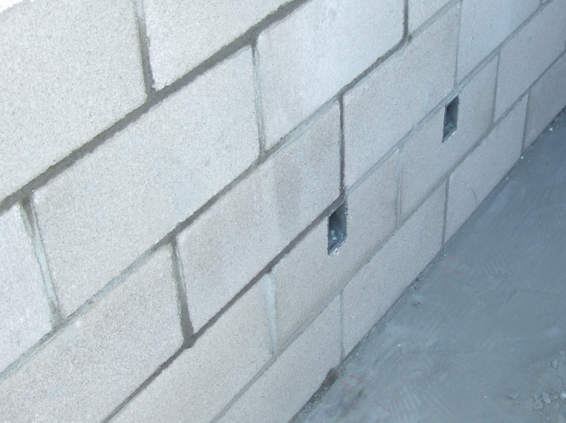 Omni Block walls are set on engineered footings and stems. There is very little movement, if any. Similar materials expand at the same rate when exposed to temperature variations. The drywall compound does not crack on Omni Block walls. Drywall compound does not contain formaldehyde chemicals and does not outgas like drywall. Drywall sheets contain formaldehyde. 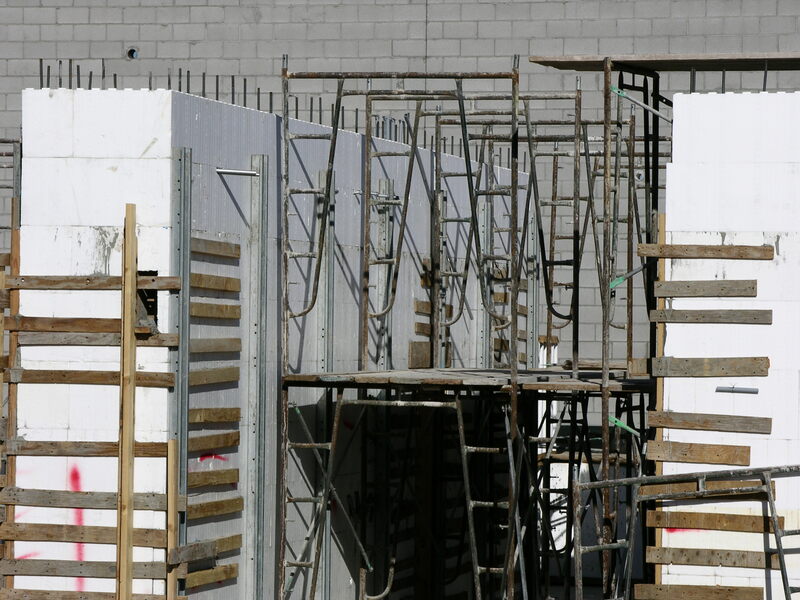 Comparison 7 focusses on the mandatory requirement of drywall to finish the interiors of ICF walls and the Omni Block option to leave the interiors exposed with block or to coat the wall surface with drywall compound. The thermal mass of an ICF wall is covered by the EPS heat resistant layer making the additional layer of drywall a non-factor thermally. The exposed thermal mass of an Omni Block interior is extremely important to the overall thermal performance and comfortability. 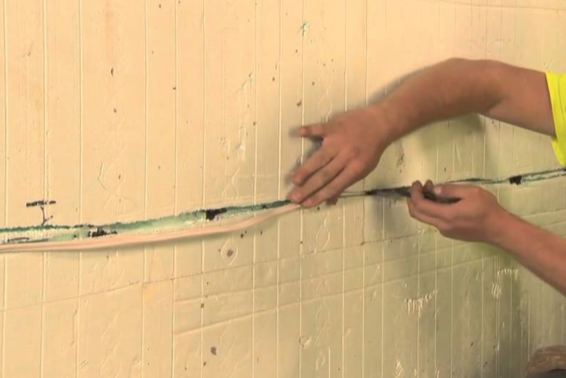 Applying a thin coat of drywall compound does not negatively affect this performance. Section under construction March 25, 2019… more to come.